Guatemala : When and where to go? The rainy season lasts from June to October and dry season from November to May. But the latter is not free of rainfalls, especially in some regions, most of the time in the afternoon. In the Pacific coast, the hotter weather is often intense with temperatures around 38°C, and high humidity during the heavy rainy season. In the mountains, the nights are very cold, but during the dry season, these are pleasant. The best time to visit the country is from November to April, when the weather is pleasant almost everywhere. During the rainy season, it rains a lot in this region and the temperature remains very low. By against, between October and May, the mountains offer a very pleasant climate with a very bearable heat. Around the region of Peten, where the vegetation is composed of forest and jungle, there are a hot and humid with alternating hot and dry. On the Caribbean coast, one can expect a hot and humid climate throughout the year. For a stay in Guatemala, the dry season from late December until mid-April is the best time. During this season, the climate of the country boils down to a pleasantly sweet heat. Greatly influenced by the Mayan culture, Guatemala is full of wonders. The capital, Guatemala City, is quite large and isn't very attractive: However, it has some interesting museums like the Popol Vuh Museum and the National Museum of Archeology and Ethnology. On the other hand, Antigua is a beautiful city, despite the many earthquakes it has suffered: Colonial buildings still standing, museum of Mayan artifacts, cobbled streets, courtyards hidden behind massive doors, the Sunday market, which will not fail to seduce you. The most enthusiasts can climb to the top of the Pacaya volcano, near to Antigua, the breathless ascent will be rewarded with a spectacle of "Sound and Light" entirely natural, with roaring noises and streams of lava. Be careful! In the Peten area, the ancient Mayan city of Tikal and its pyramids were built in the middle of a huge national park, it has many scattered traces among the tropical jungle: You can visit the main ones accompanied by monkeys, parrots and enchanting smells of the forest. Chichicastenango is a popular tourist destination because of its Sunday and Thursday markets; you cannot escape from its colorful attraction, the noisy processions with the religious brotherhoods, the smells of incense, spells recited by shamans, flower stalls, various products and very nice local handicrafts. 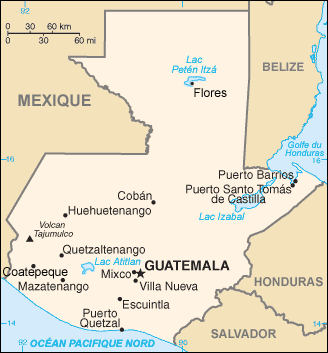 International airlines have flights to Guatemala, via the U.S. or Mexico. The currency in circulation is the quetzal. The budget required is very reasonable: A double room will cost less than €20, and a proper meal in the restaurants, less than €10. Regarding health, there is no vaccination required, but it is advisable to keep all classic vaccines up to date and also those against typhoid and hepatitis A. Do not drink tap water, and wash and peel fruits and vegetables. Also protect yourself against mosquitoes. To travel inside the country, buses run almost everywhere: They are cheap but unsafe. Private small buses provide tourist trips. In the city, taxis and buses are frequent and affordable.